(vi) the values of dynamic elastic modulus of the concrete. The ultrasonic pulse is generated by an electroacoustical transducer. 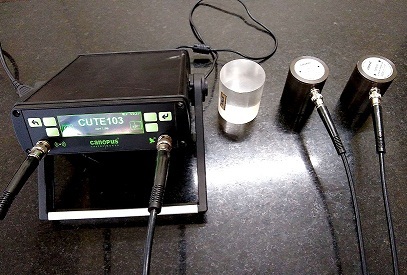 When the pulse is induced into the concrete from a transducer, it undergoes multiple reflections at the boundaries of the different material phases within the concrete. A complex system of stress waves is developed which includes longitudinal (compressional), shear (transverse) and surface (rayleigh) waves. The receiving transducer detects the onset of the longitudinal waves, which is the fastest. Because the velocity of the pulses is almost independent of the geometry of the material through which they pass and depends only on its elastic properties, pulse velocity method is a convenient technique for investigating structural concrete. The underlying principle of assessing the quality of concrete is that comparatively higher velocities are obtained when the quality of concrete in terms of density, homogeneity and uniformity is good. In case of poorer quality, lower velocities are obtained. If there is a crack, void or flaw inside the concrete which comes in the way of transmission of the pulses, the pulse strength is attenuated and it passes around the discontinuity, thereby making the path length longer. Consequently, lower velocities are obtained. The actual pulse velocity obtained depends primarily upon the materials and mix proportions of concrete. Density and modulus of elasticity of aggregate also significantly affect the puise velocity. IS-13311 (Part 1):1992 (Reaffirmed- May 2013) “Non-Destructive Testing of Concrete- Methods of Test (Ultrasonic Pulse Velocity)"
Once the ultrasonic pulse impinges on the surface of the material, the maximum energy is propagated at right angles to the face of the transmitting transducer and best results are, therefore, obtained when the receiving transducer is placed on the opposite face of the concrete member (direct transmission or cross probing). However, in many situations two opposite faces of the structural member may not be accessible for measurements. In such cases, the receiving transducer is also placed on the same face of the concrete members (surface probing). Surface probing is not so efficient as cross probing, because the signal produced at the receiving transducer has an amplitude of only 2 to 3 percent of that produced by cross probing and the test results are greatly influenced by the surface layers of concrete which may have different properties from that of concrete inside the structural member. The indirect velocity is invariably lower than the direct velocity on the same concrete element. This difference may vary from 5 to 20 percent depending largely on the quality of the concrete under test. For good quality concrete, a difference of about 0.5 km/ sec may generally be encountered. To ensure that the ultrasonic pulses generated at the transmitting transducer pass into the concrete and are then detected by the receiving transducer, it is essential that there be adequate acoustical coupling between the concrete and the face of each transducer. Typical couplants are petroleum jelly, grease, liquid soap and kaolin glycerol paste. If there is very rough concrete surface, it is required to smoothen and level an area of the surface where the transducer is to be placed. If it is necessary to work on concrete surfaces formed by other means, -for example trowelling, it is desirable to measure pulse velocity over a longer path length than would normally be used. A minimum path length of 150 mm is recommended for the direct transmission method involving one unmoulded surface and a minimum of 400 mm for the surface probing method along an unmoulded surface. The natural frequency of transducers should preferably be within the range of 20 to 150 kHz. Generally, high frequency transducers are preferable for short path lengths and low frequency transducers for long path lengths. Transducers with a frequency of 50 to 60 kHz are useful for most all-round applications. Since size of aggregates influences the pulse velocity measurement, it is recommended that the minimum path length should be 100 mm for concrete in which the nominal maximum size of aggregate is 20 mm or less and 150 mm for concrete in which the nominal maximum size of aggregate is between 20 to 40 mm. In view of the inherent variability in the test results, sufficient number of readings are taken by dividing the entire structure in suitable grid markings of 30 x 30 cm or even smaller. Each junction point of the grid becomes a point of observation. Transducers are held on corresponding points of observation on opposite faces of a structural element to measure the ultrasonic pulse velocity by direct transmission, i.e., cross probing. If one of the faces is not- accessible, ultrasonic pulse velocity is measured on one face of the structural member by surface probing. Surface, probing in general gives lower pulse velocity than in case of cross probing and depending on number of parameters, the difference could be of the order of about 1 km/sec. Smoothness of contact surface under test affects the measurement of ultrasonic pulse velocity. For most concrete surfaces, the finish is usually sufficiently smooth to ensure good acoustical contact by the use of a coupling medium and by pressing the transducer against the concrete surface. When the concrete surface is rough and uneven, it is necessary to smoothen the surface to make the pulse velocity measurement possible. In general, pulse velocity through concrete increases with increased moisture content of concrete. This influence is more for low strength concrete than high strength concrete. The pulse velocity of saturated concrete may be up to 2 percent higher than that of similar dry concrete. In general, drying of concrete may result in somewhat lower pulse velocity. As concrete is inherently heterogeneous, it is essential that path lengths be sufficiently long so as to avoid any error introduced due to its heterogeneity. In field work, this does not pose any difficulty as the pulse velocity measurements are carried out on thick structural concrete members. However, in the laboratory where generally small specimens are used, the path length can affect the pulse velocity readings. The shape and size of the concrete member do not influence the pulse velocity unless the least lateral dimension is less than a certain minimum value, for example the minimum lateral dimension of about 80 mm for 50 kHz natural frequency of the transducer. Table 1 gives the guidance on the choice of the transducer natural frequency for different path lengths and minimum transverse dimensions of the concrete members. Variations of the concrete temperature between 5 and 30°C do not significantly affect the pulse velocity measurements in concrete. At temperatures between 30 to 60°C there can be reduction in pulse velocity up to 5 percent. Below freezing temperature, the free water freezes within concrete, resulting in an increase .in pulse velocity up to 7.5 percent. When concrete is subjected to a stress which is abnormally high for the quality of the concrete, the pulse velocity may be reduced due to the development of micro-cracks. This influence is likely to be the greatest when the pulse path is normal to the predominant direction of the planes of such micro-cracks. This occurs when the pulse path is perpendicular to the direction of a uniaxial compressive stress in a member. This influence is generally insignificant unless the stress is greater than about 60 percent of the ultimate strength of the concrete. The pulse velocity measured in reinforced concrete in the vicinity of reinforcing bars is usually higher than in plain concrete of the same composition. This is because, the pulse velocity in steel is 1.2 to 1.9 times the velocity in plain concrete and, under certain conditions, the first pulse to arrive at the receiving transducer travels partly in concrete and partly in steel. The apparent increase in pulse velocity depends upon the proximity of the measurements to the reinforcing bar, the diameter and number of the bars and their orientation with respect to the path of propagation. The ultrasonic pulse velocity of concrete is mainly related to its density and modulus of elasticity. This in turn, depends upon the materials and mix proportions used in making concrete as well as the method of placing, compaction and curing of concrete. For example, if the concrete is not compacted as thoroughly as possible, or if there is segregation of concrete during placing or there are internal cracks or flaws, the pulse velocity will be lower, although the same materials and mix proportions are used. The quality of concrete in terms of uniformity, incidence or absence of internal flaws, cracks and segregation, etc, indicative of the level of workmanship employed; can thus be assessed using the guidelines given in Table 2, which have been evolved for characterising the quality of concrete in structures in terms of the ultrasonic pulse velocity. Table 1 : Velocity Criterion for Concrete Quality Grading. Since actual values of the pulse velocity obtained, depend on a number of parameters, any criterion for assessing the quality of concrete on the basis of pulse velocity as given in Table 2 can be held as satisfactory only to a general extent. However, when the comparison is made amongst different parts of a structure, which have been built at the same time with supposedly similar materials, construction practices and supervision, the assessment of quality becomes more meaningful and reliable. The assessment of compressive strength of concrete from ultrasonic pulse velocity values is not adequate because the statistical confidence of the correlation between ultrasonic pulse velocity and the compressive strength of concrete is not very high. The reason is that a large number of parameters are involved, which influence the pulse velocity and compressive strength of concrete to different extents. However, if actual concrete materials and mix proportions adopted in a particular structure are available, then estimate of concrete strength can be made by establishing suitable correlation between the pulse velocity and the compressive strength of concrete specimens made with such materials and mix proportions, under environmental conditions similar to that in the structure. The estimated strength may vary from the actual strength by 20 percent. The correlation so obtained may not be applicable for concrete of another grade or made with different types of materials.